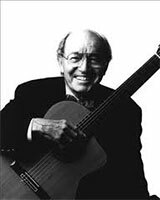 Charlie Byrd was born in Suffolk and grew up in the neighboring community of Chuckatuck in the company of local musicians who gathered at his father's general store during the Great Depression. Byrd took his first guitar lesson at age 10 and played at local high school dances as a teenager. He matriculated to VPI in 1942 in an accelerated war-time program, playing in the university's renowned Southern Colonels orchestra. After five quarters at VPI, he was drafted into the Army and sent to Europe. He played for the troops during his leisure time, and remained in Europe after his tour of duty, traveling with a G. I. orchestra sponsored by Army Special Services. When Byrd returned to the United States, he enrolled in Manhattan's Harnett National School, with an emphasis on jazz guitar, and helped to support himself by playing pick-up jazz gigs around town. He took up the study of classical guitar in the late 1940s. Thanks to a scholarship, Byrd traveled to Siena, Italy in 1954 for six weeks' study with the great Spanish classical guitarist, Andres Segovia. Byrd rounded out his studies in South America, where he learned music with a Latin beat. A master of diverse musical styles, Byrd never blended them. Instead, his programs included something for every musical taste - as he put it, everything from "Blues to Bach." His 1962 album "Jazz Samba," with saxophonist Stan Getz, is credited with introducing the bossa nova movement to America. He was designated the first "Maryland Arts Treasure" in 1997, and was named a Knight of the Rio Branco by the government of Brazil in 1999. His last performance was Sept. 18, 1999 at the Maryland Inn's King of France Tavern in Annapolis, less than three months before his death.